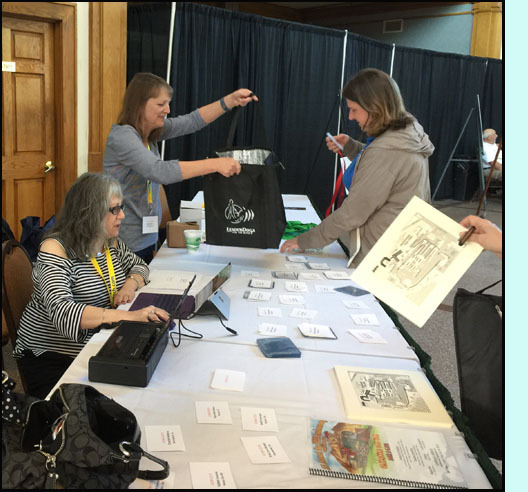 Getting everyone settled with their insulated tote bag, conference T-shirt, commmorative pen, program guide and other materials at the registration table were Conference Co-Chair Mary Phagan-Kean (seated), Debbie Nelson (standing) and Bernice Meyer (taking the photo). 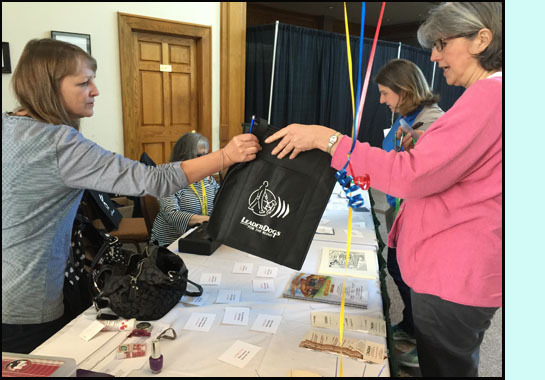 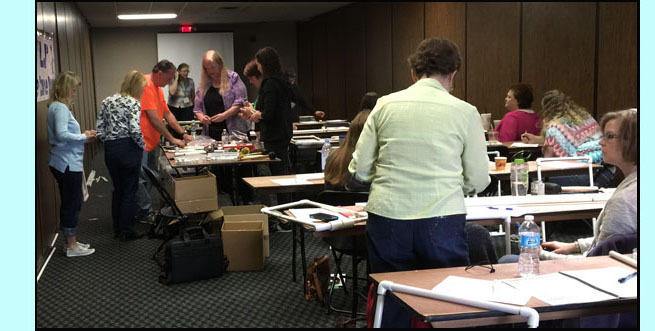 Angel Gautreaux (wife of Conference Co-Chair Lynn) assembled all the packets -- thank you so much, you're an Angel indeed! 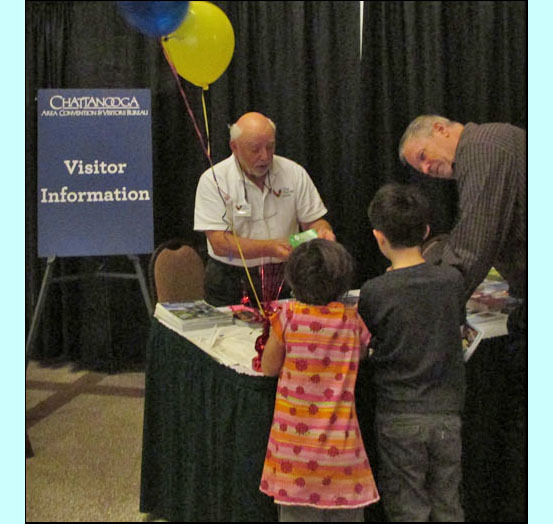 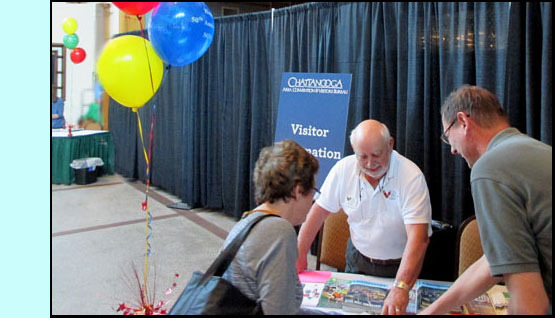 [Right] Our Visitors' Concierge was set up near the registration desk to help participants and their families and friends find entertainment and places to sightsee. 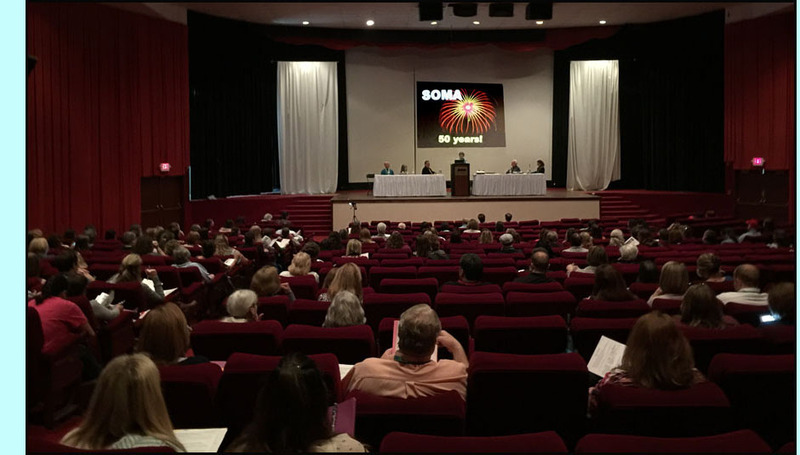 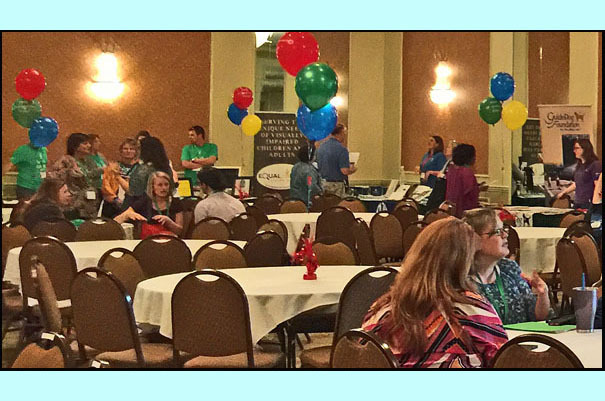 The balloons were festooned throughout the conference to commemorate SOMA's 50th anniversary. 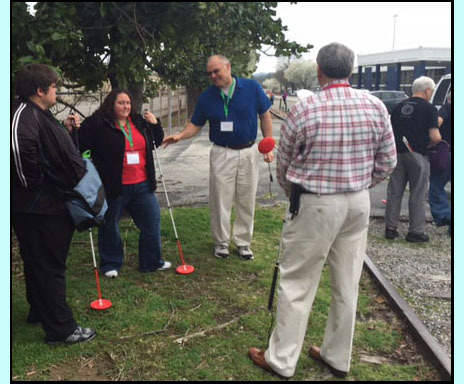 Below left: Participants [L to R] Matt Stewart, unknown, Steve Hoyt, and Bill Robinson try the Dakota Disk cane tips on rough terrain. 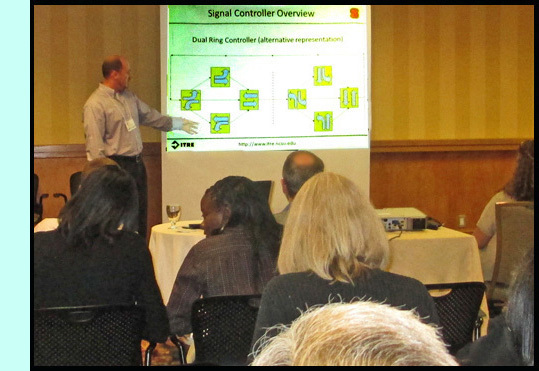 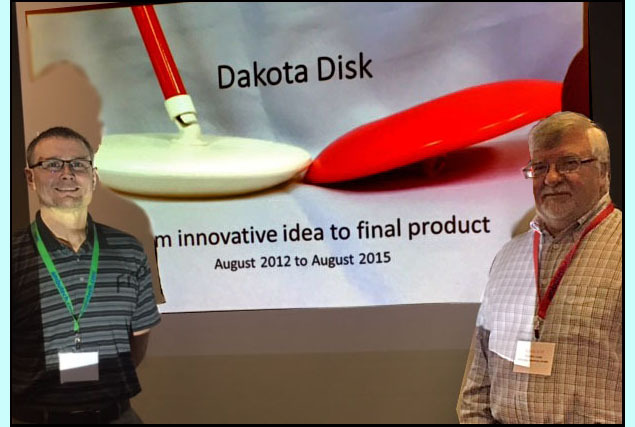 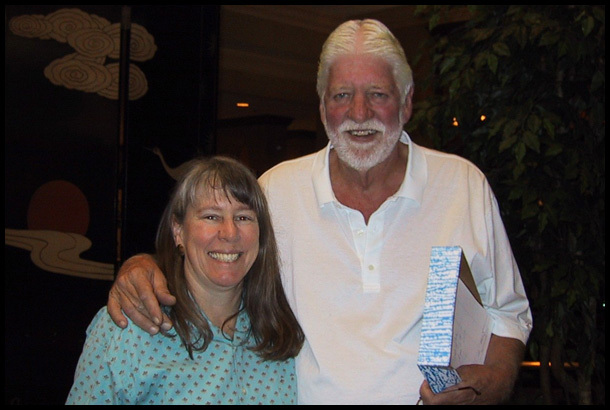 Below right: Paul Olsen (L), creator of the Dakota Disk cane tip, and Gordon Hukek (R) of Ambutech which developed the tip, standing in front of their powerpoint after their presentation. 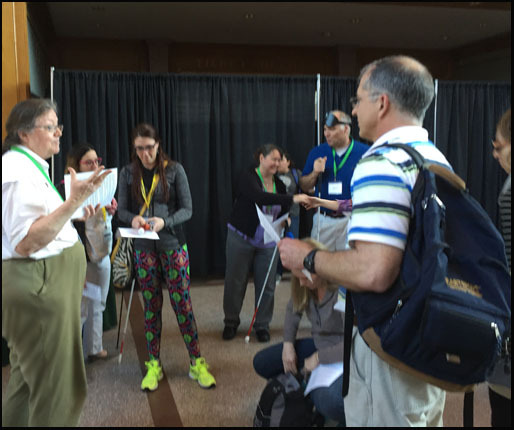 [Near left]: Tara Brown-Ogilvie (R) and Dona Sauerburger (L) after presenting "Teaching Deaf-Blind people to communicate with the public" with Dr. Gene Bourquin (who is taking the picture). 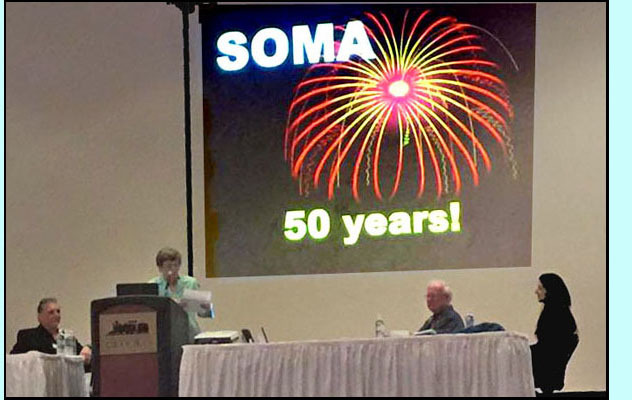 Lynn Gautreaux and Mary Phagan-Kean, Conference Co-Chairs, welcomed everyone to SOMA's 50th Anniversary O&M Conference. 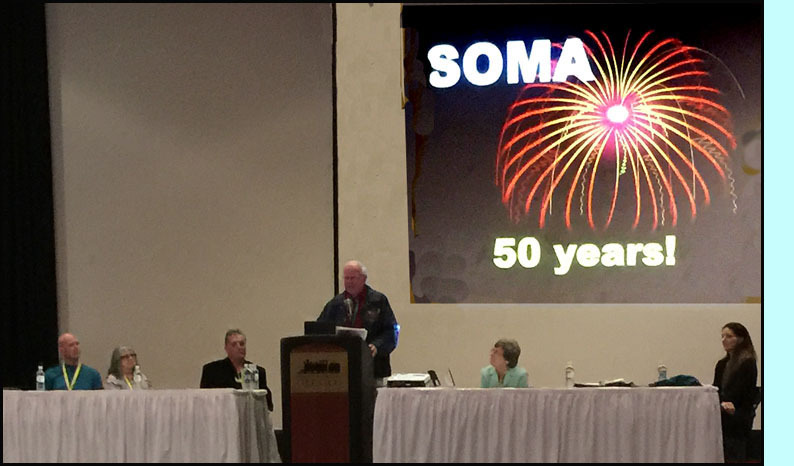 Dona Sauerburger led the SOMA Celebration, starting by thanking Kathy Yale for researching the history. 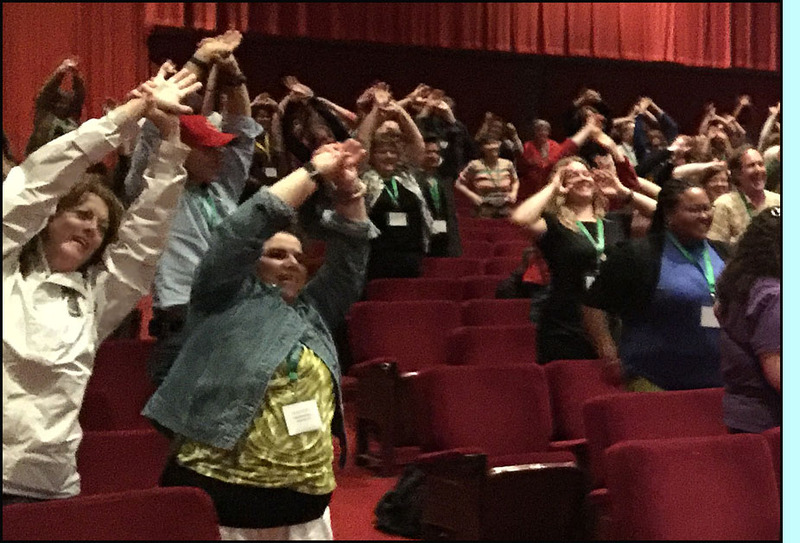 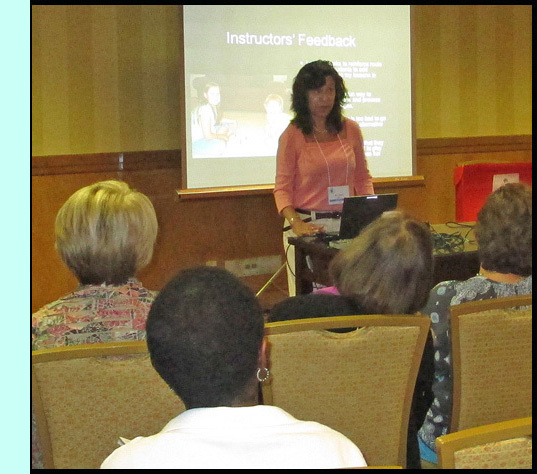 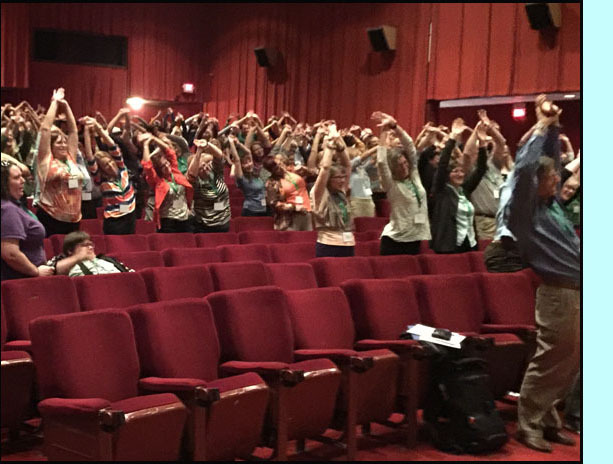 [Below] Susan Austin rejuvenated everyone with Chair Yoga, and they loved it! 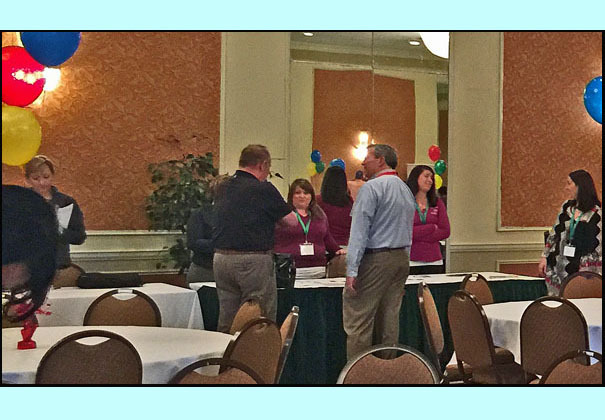 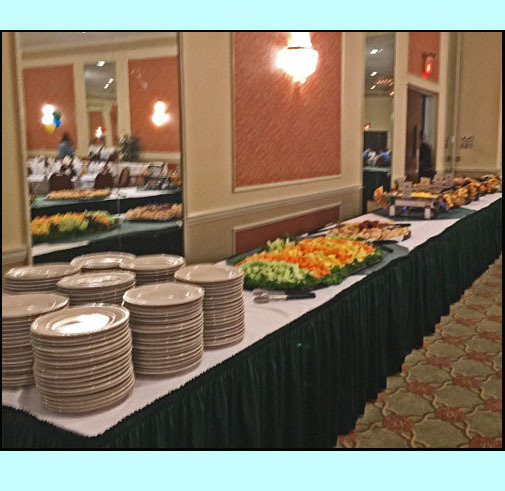 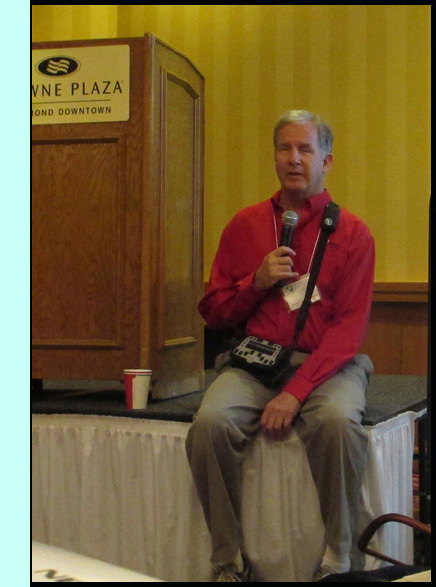 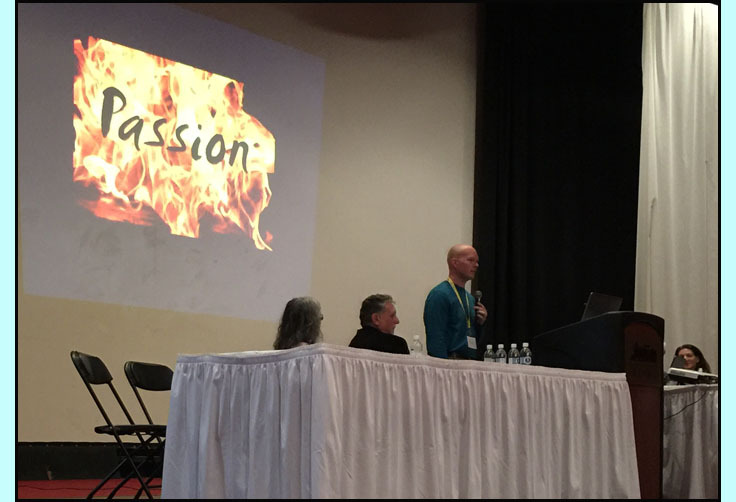 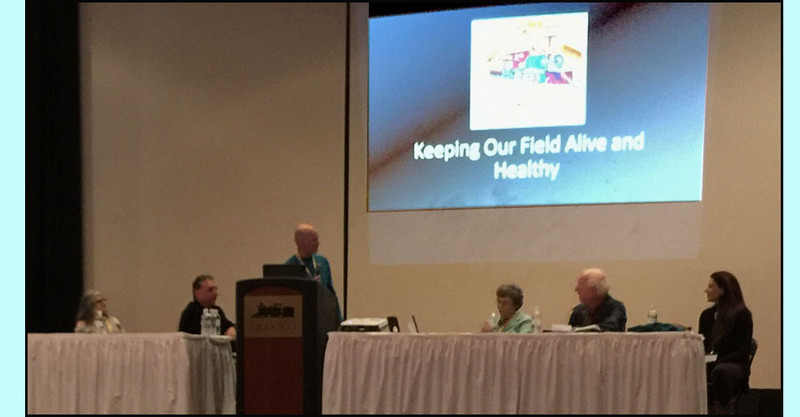 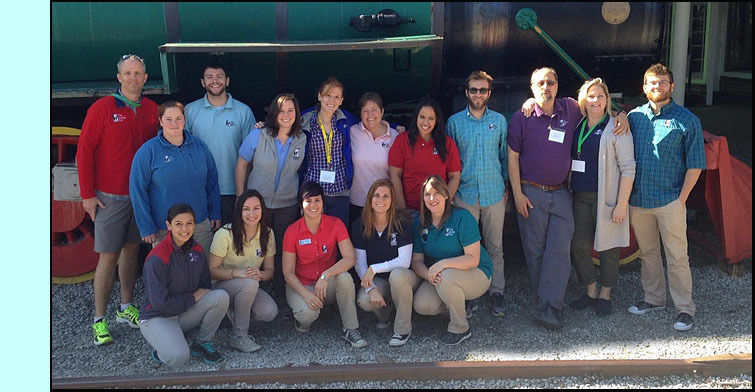 Mickey Damelio's keynote speech "Keeping the O&M profession alive and healthy," inspired the participants. 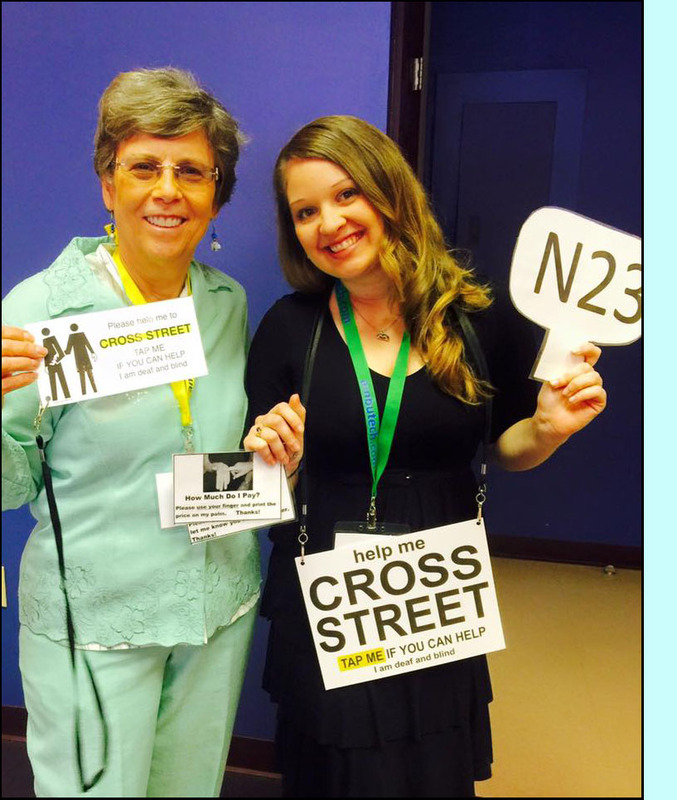 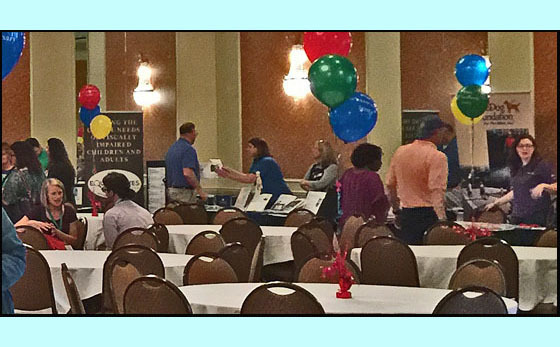 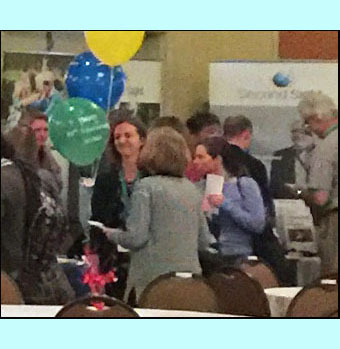 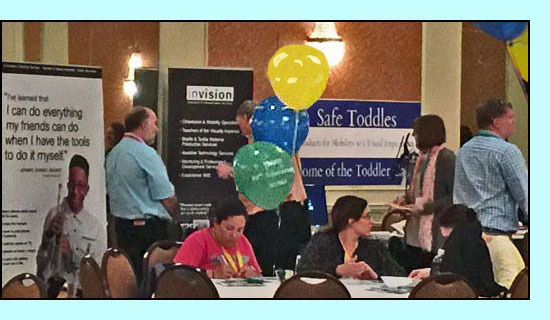 [Below] Bernice Meyer, Exhibit Coordinator, introduced the vendors who each explained what was at their tables. 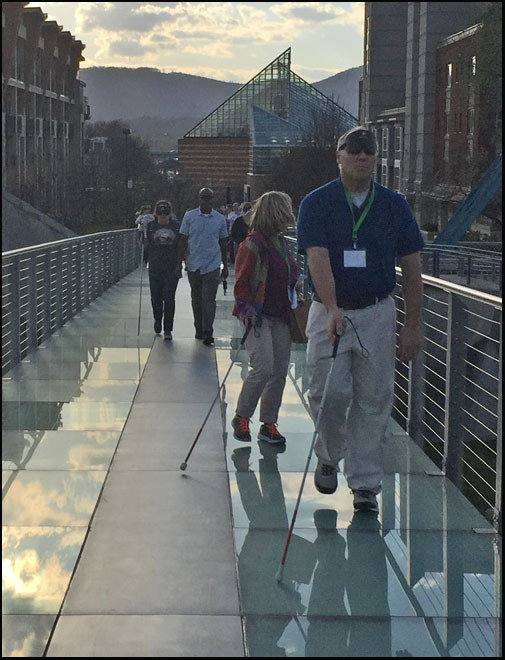 The Guide Dog Mobility Instructor session Monday evening featured a video presentation recorded at the International Guide Dog Federation Seminar in Japan. 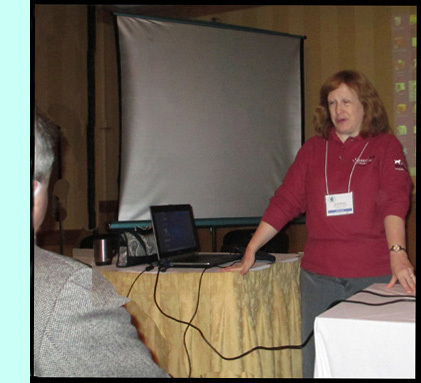 The viewing was followed by a discussion with the Japanese presenter, using an interpreter and skype with a split screen. 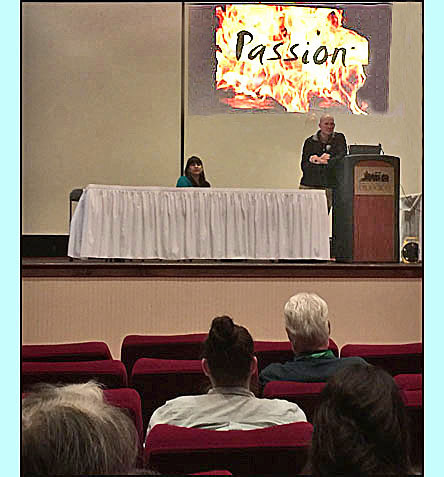 The presenter was unable to see the participants during the discussion, so this picture was sent to him afterwards as a greeting and thank-you. 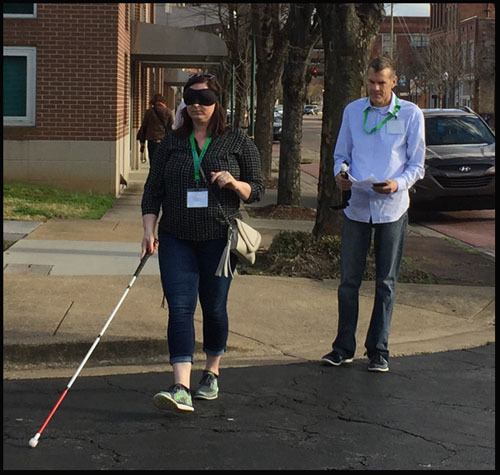 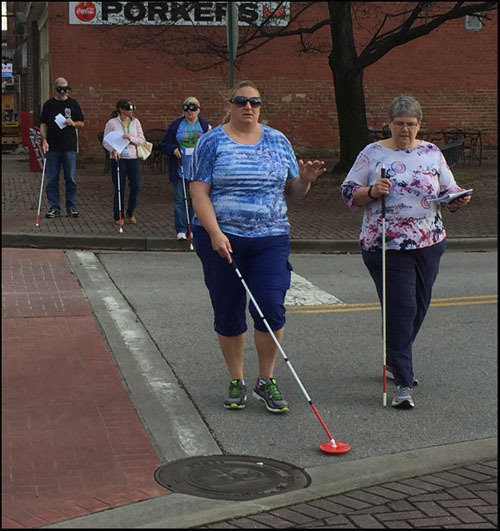 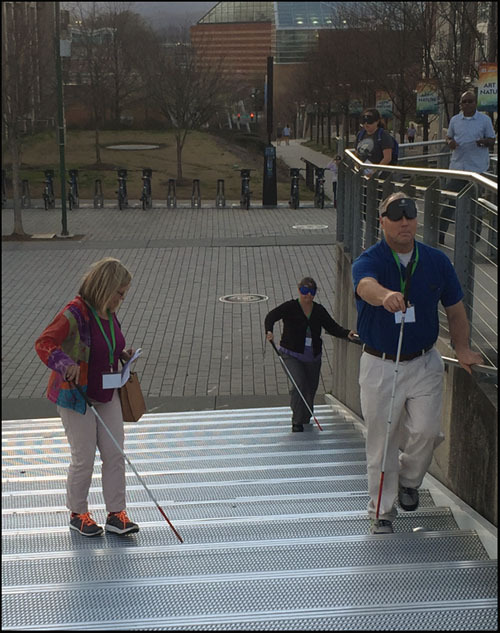 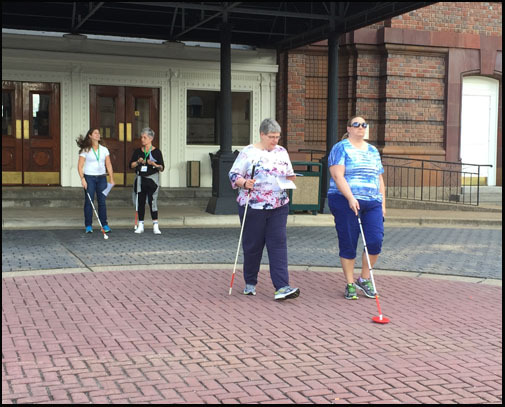 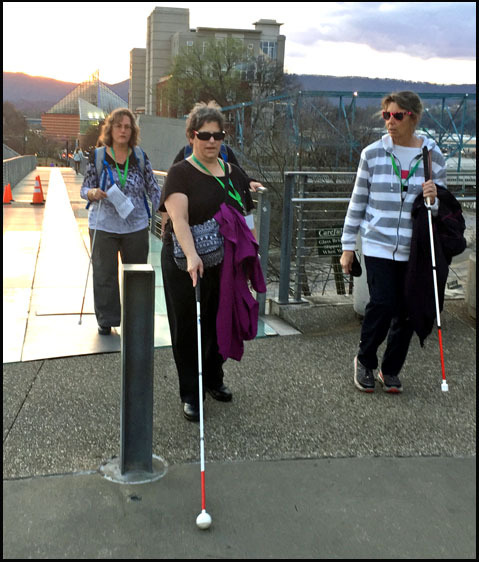 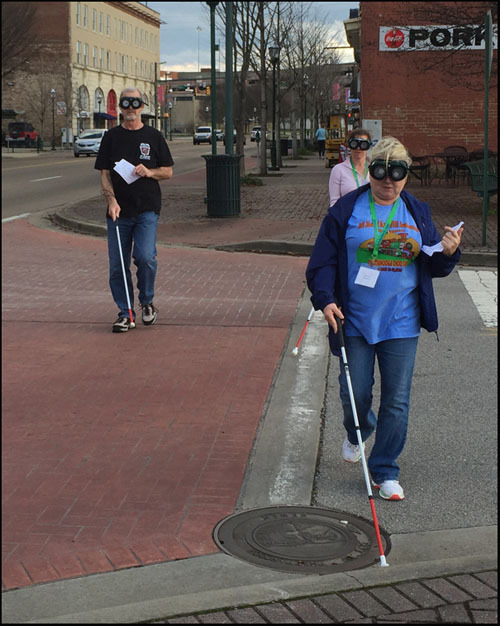 Special thanks to Dorothy Morris and Kitty Burnett Cress for organizing a Blindfold Walk with lots of interesting features and challenges, ending in walking over a glass bridge. 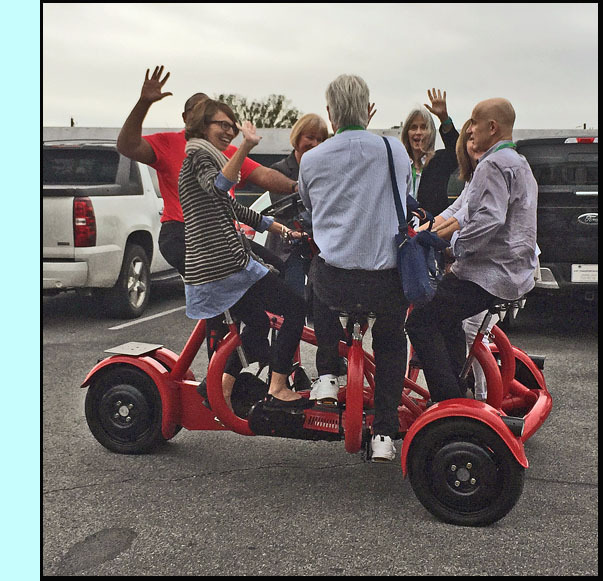 It allowed us to test our mettle and give us some great experiences! 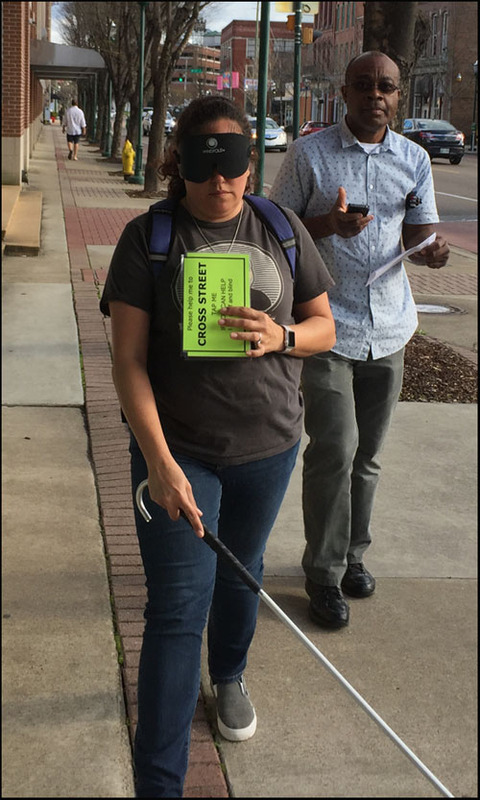 Some people wore blindfolds and some wore vision simulators while others monitored their progress, waiting for their turn to don the blindfold or simulators. 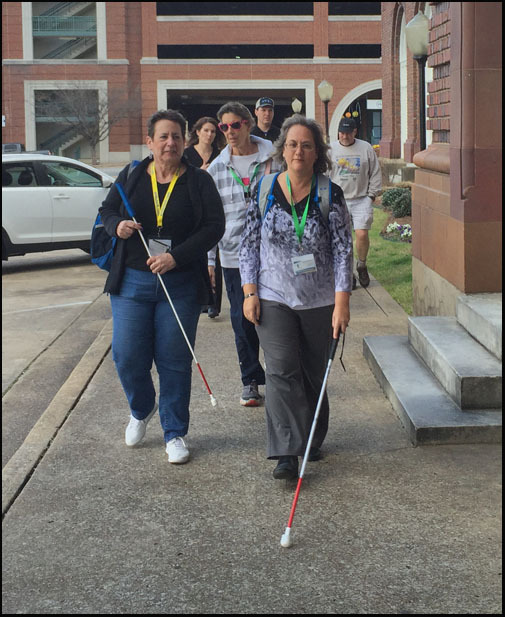 Guide Dog Mobility Instructors and Apprentices from The Seeing Eye. 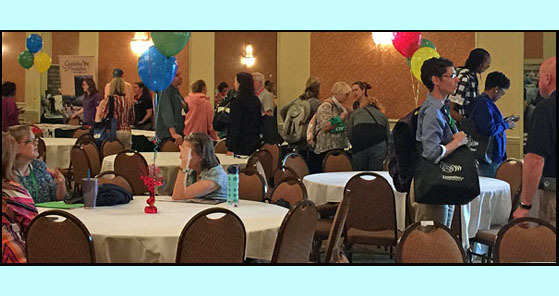 Reuniting with old friends and making new ones was one of the biggest benefits of SOMA! 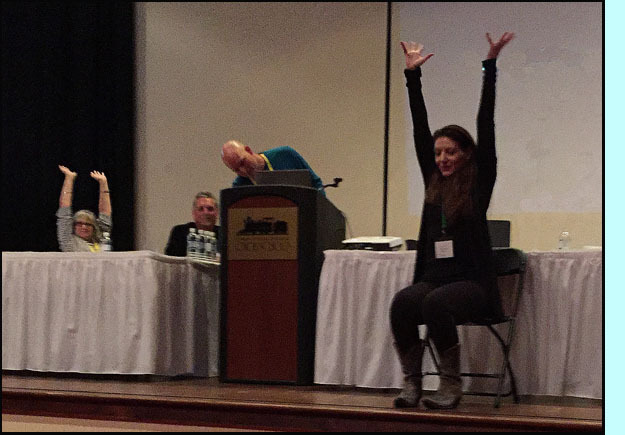 If you have pictures of you and your friends at the conference, send them in to Dona Sauerburger and we'll post them! 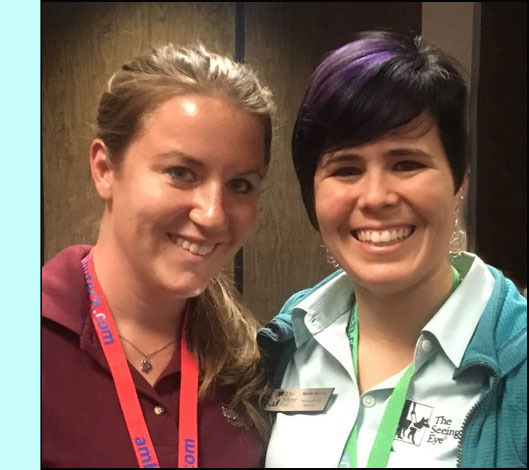 Jackie Audette, apprentice at Guide Dog Foundation said, "I was so excited to attend SOMA for my own professional reasons, but I was pleasantly surprised with a friendly reunion!! 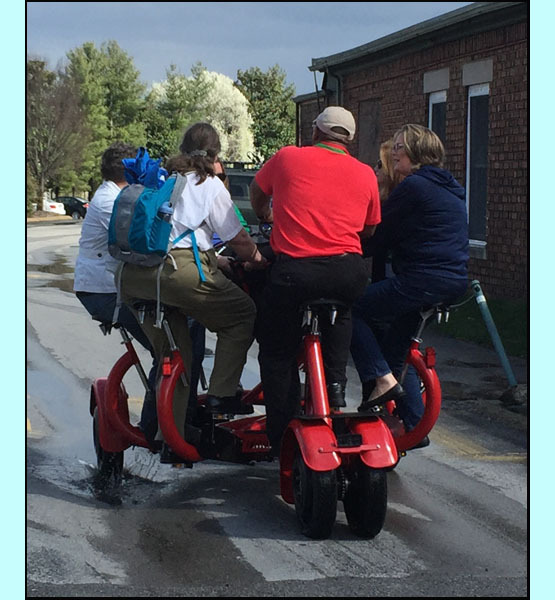 I unexpectedly ran into two good friends I had from college -- we all used to puppy-raise together at Rutgers University, and I hadn't seen either of them in many years. 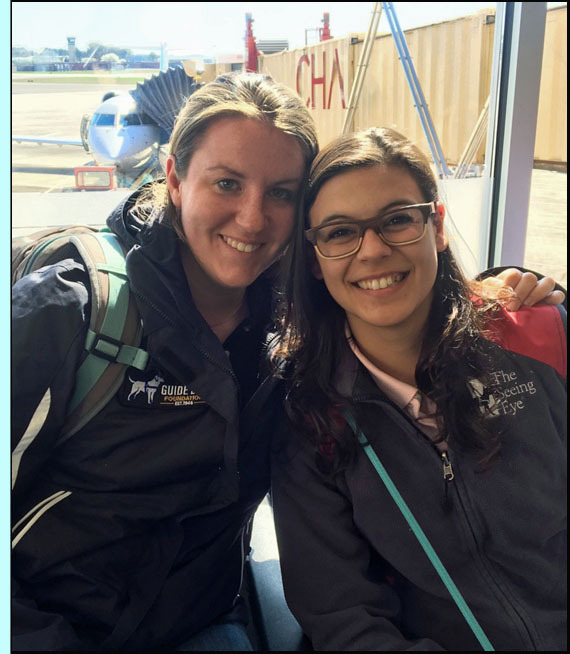 "The first photo to the right shows me with Nicole Murray (a GDMI at The Seeing Eye) and the other shows Lauren Wheeler and me saying goodbye before heading on our flight home -- Lauren is an apprentice at The Seeing Eye." 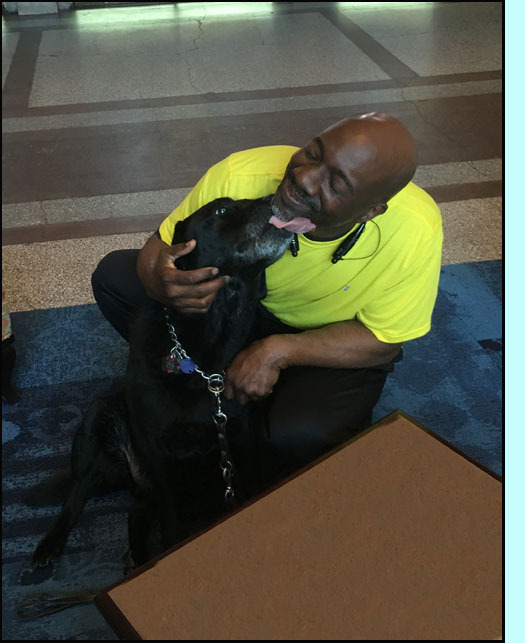 The family who puppy-raised Linda Chung's guide dog more than 7 years ago drove from Atlanta to reunite with Rocky and meet Linda. 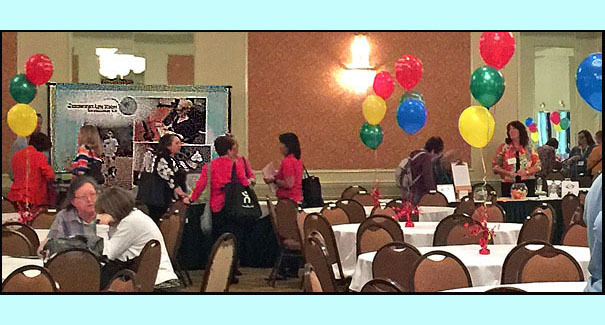 The first photo to the left shows John Green and Rocky having a joyful reunion in the Choo Choo lobby. 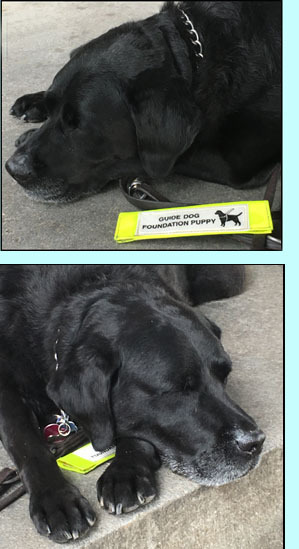 When Rocky saw the "Guide Dog Foundation Puppy" tag that had been on his leash, he recognized and took possession of it. 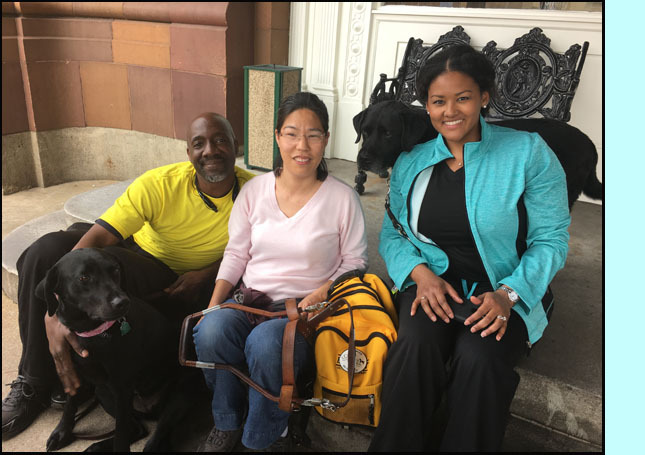 The last photo shows John, Rocky, Linda, Tiffany and their pet chocolate lab Harley on the steps in front of the Choo Choo hotel. 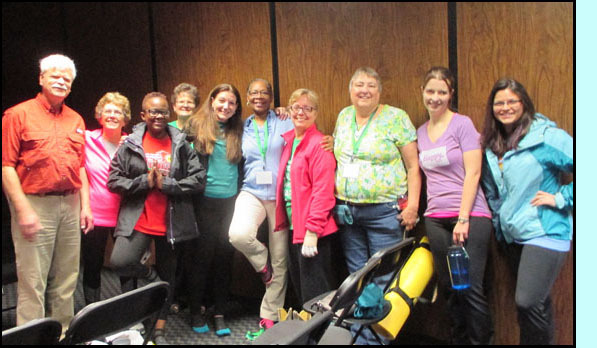 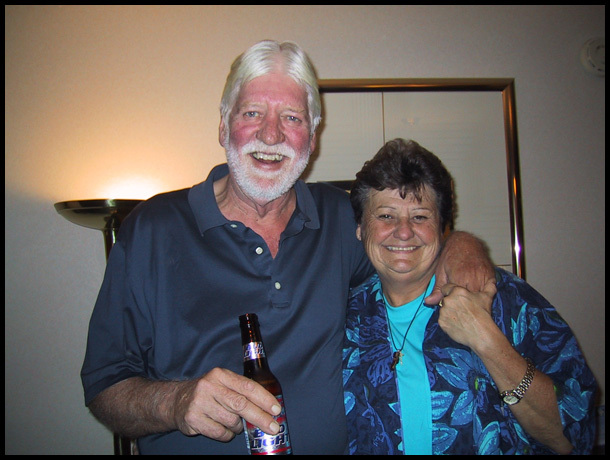 This was the first time Linda had met the Greens, and she says they will definitely keep in touch! 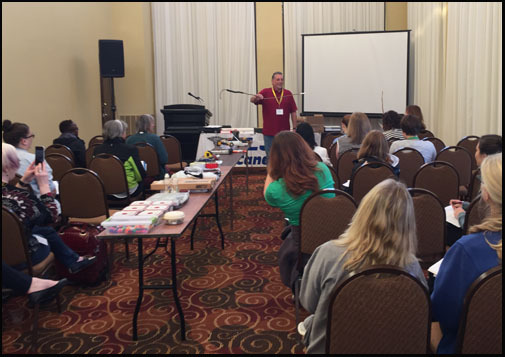 Lynn's session on repairing and modifying canes. 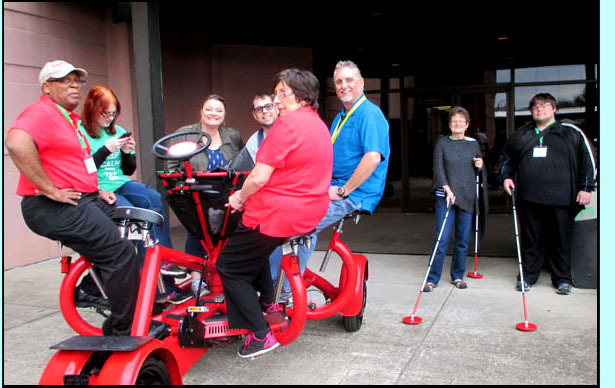 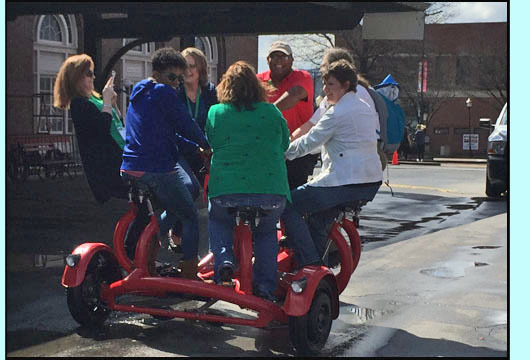 A lot of people enjoyed riding the 7-person CoBi bike! 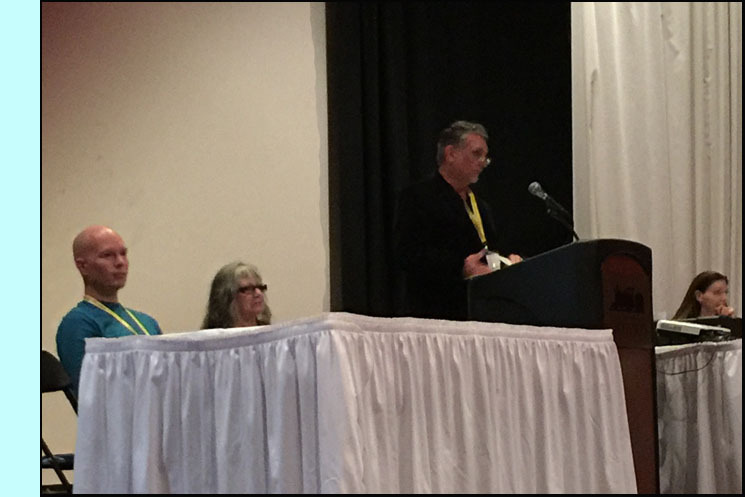 Mickey Damelio and Eileen Bischof facilitated the discussion at the closing session. 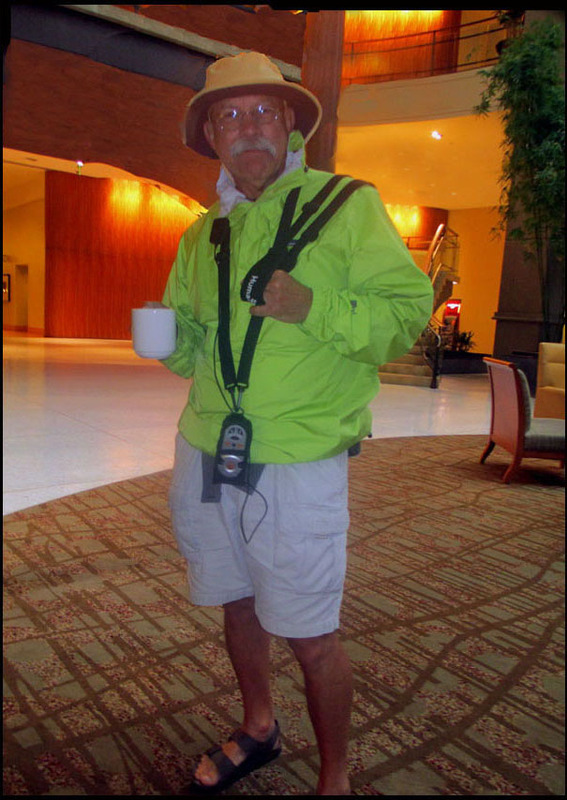 Craig Phillips returns from his all-day feet-in-the-street Trekker Breeze workshop. 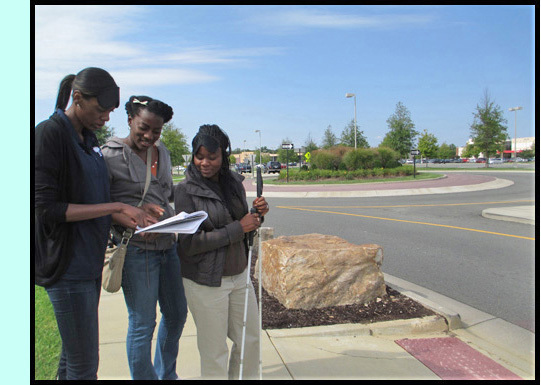 Felisa Benbow, Nielah B. and Lauren Porchia study their notes at a pre-conference feet-in-the-street workshop on roundabouts.